Talented and audacious, with working-class origins, Westwood embodies, in the popular imagination, one of the iconic figures in the mythology of the western: the outlaw who has managed to give the sheriff the slip and earn honour and respect from the community. A rebel by chance rather than by choice, a conservative revolutionary in the tradition dating back to the suffragette movement, Dame Vivienne represents quintessential Britishness strongly rooted in culture. Although she is the ‘queen of punk’ with a particular interest in philosophy and the painting of bygone days, a social activist and aesthete who loves to delve into the past, she constantly and inexplicably finds herself in the vanguard. In an account that starts from the creation of fifteen garments and accessories, this book pinpoints references to past times and art history, together with aesthetic and philosophical elements. 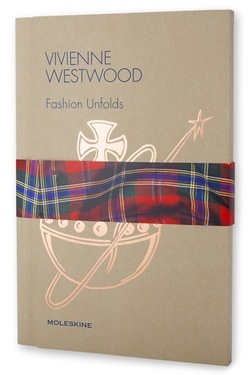 After the ready-mades of the 1960s, in which she made use of mass-produced clothes, took them apart, cut them up and then mixed them together — reflecting the growing fusion between art and fashion — Westwood was able to indulge her intellectual curiosity with the help of books and pictures. She did not sketch her models on paper, but created them directly using the moulage technique on a small dressmaker’s dummy or even herself, working around the figure, so that the final result was the modification of the body’s shape, with radical structural alterations and asymmetric cuts. Dopo aver letto il libro Vivienne Westwood fashion unfolds di Matteo Guarnaccia ti invitiamo a lasciarci una Recensione qui sotto: sarà utile agli utenti che non abbiano ancora letto questo libro e che vogliano avere delle opinioni altrui. L’opinione su di un libro è molto soggettiva e per questo leggere eventuali recensioni negative non ci dovrà frenare dall’acquisto, anzi dovrà spingerci ad acquistare il libro in fretta per poter dire la nostra ed eventualmente smentire quanto commentato da altri, contribuendo ad arricchire più possibile i commenti e dare sempre più spunti di confronto al pubblico online.